The last date of comment parsing is now part of the addon's filename. 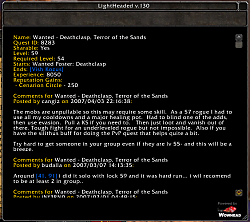 LightHeaded is a very simple addon that displays quest information and comments from http://www.wowhead.com in game, eliminating the need to Alt-Tab when you get stuck on quest. This addon was inspired by qcomments and wowhead_quests, which both serve a similar purpose. Data is only loaded when you first request it, so you can be sure you're not using more memory than you need to. I HIGHLY suggest using this addon with TomTom, another one of my addons (http://www.wowinterface.com/download...32-TomTom.html ). This allows you to simply click any coordinate in LightHeaded to add it to your map as a waypoint. /lh bgalpha <0.0-1.0> - Changes the alpha of the LH window background textures, so you can see the world. LightHeaded now includes the English descriptions and introductory text for most of the quests in the game. This is disabled by default, but can be enabled for those players that are not playing in their native locale. LightHeaded supports sending coordinates to TomTom, MapNotes, Cartographer2 and Cartographer3. include the wowhead logo in the frame that displays this information. owe them at least that much. Thank you. Thanks for using my addons! Add new parse, update integration, update toc. this should get things back up and working. areaIds, so waypoints should be set in the correct zone. Thank you for the new parse upload, especially as there was one on Dec 1!! Apparently, 8.0.1 removed pretty much all the APIs used in LightHeaded:GetMapIdFromWowheadZone(zoneId), causing everything to explode when I try to click a destination to get an arrow to it coordinates. Replacing the body of that function with "return nil, false, nil" seems to get TomTom waypoints working for me, though I'm not sure what else I'm missing out on that this was supposed to do (I just got back into the game recently). I have a question that's always bugged me. How come Lightheaded isn't identified as an addon in the Curse/Twitch updater? It's the only addon in my folder that doesn't show up in the list. Since it's the beginning of the expac, could there be more frequent parses of the wowhead db, so there's more likelyhood of information being there for any particular quest? Given that that might be too big an issue, could there be a scheduled parse about a week after each significant patch? I have an older machine, and having a browser open at the same time as wow is a real problem, and Lightheaded is a wonderful tool that enables me to look things up while ingame. And, minor request: it was a wonderful thing when Cladhaire (or whoever) instituted the rule that the date of the most recent DB parse would be included in the filename. Could that happen again, please? I'll do my best, but its hard to commit to regular updates. As for the filename, sure I can re-add that to the release version, but it's also included in the commit log/changelog that's released and updated with each addon. I understand, which is why I realize it's a major request. When I decided that 'about a week after' for major patches, as an alternate, my hope is that a week will give time for folks to comment on wowhead aboutg the new stuff, so the parse can pick it up and include it. Thanks for the consideration, I do appreciate it. Do you have a patreon? I don't, I've accepted donations from the community for years but I don't think that's necessary. I'm not doing much other than the occasional fix to the addon as time permits. Lunarwtr is doing most of the parsing and then sending me the updates. After a complete uninstall and reinstall, everything seems to be working correctly...except the quests from Darkmoon Faire. Then I get a LUA warning and an error mssg....LH_Data_c.lua line 136351 etc. etc. 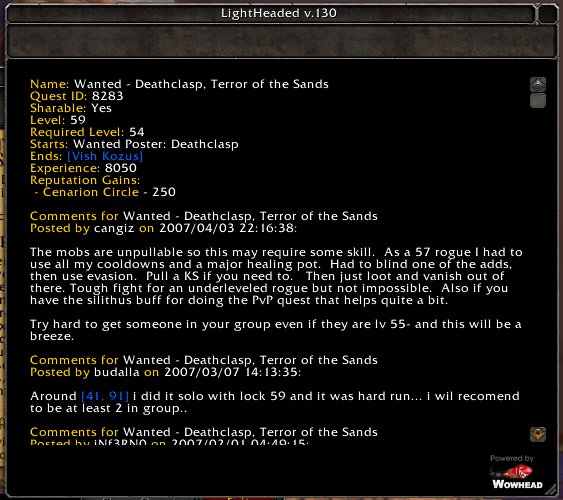 The quest you refer to had some strange CTRL characters in one of the comments that was causing the addon problems. It should be resolved next update. Good news ... uninstalled completely, re-installed ... it works perfectly now. Thanks to those that took the time to help this geezer. And a big thanks to Cladhaire!! Took the time to try disabling all but lh this AM (simply clicked Disable All, then checked off LH to enable it only) ... no LH window plus /lh config or /lh autodetails did nothing. No error messages either. Last ditch effort is to uninstall LH completely and install fresh. Hi folks. I appreciate the reports and the kind words. Unfortunately I don't actively play WoW, so if you are experiencing an issue I need you to disable other addons other than LightHeaded (and any Bugsack/Buggrabber you use to catch errors) and find a way to reproduce the issue you're experiencing. Any error messages you have will be useful in resolving any issues. Unfortunately when I go into the game and click around I can't reproduce these issues, so I need help in finding out what might be happening.